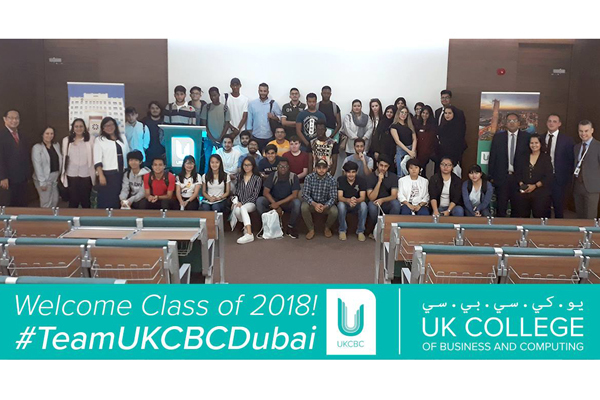 Having inaugurated its new campus in July, the UK College of Business & Computing Dubai (UKCBC) welcomed its first batch of students on September 23 for their inaugural week. UKCBC has secured a culturally diverse maiden cohort with students coming from different countries. "We have seen a great interest in our qualifications from both local and international students. We are extremely delighted to report 35 per cent international students for our first cohort and attracting students from GCC, China, UK, Uzbekistan and West Africa in addition to UAE nationals and other expat communities in UAE such as India, Philippines & France," said Ttina Narsian, head of sales and marketing for Dubai Campus. The College currently has six campuses in Central & Greater London, including the English language arm UK College of English (UKCE), and caters to more than 3,000 students. The UK campuses offer courses in business management, computing, health and social care, travel and tourism as well as accounting courses. Located in the heart of Dubai International Academic City (DIAC) and with a campus spanning around 19,000-sq-ft, the Dubai Campus will initially deliver Pearson BTEC qualifications in business management, computing, travel & tourism, and health and social care, eventually expanding to other qualifications that suit the UAE’s higher education and employability needs. Jonathan Sandling, director of studies at UKCBC, said: "We believe we have the right mix of courses and credibility that will help our students progress in their academic journey. Our courses are carefully designed to suit the needs of all learners. Back in the UK, we have experienced faculty to deliver BTEC qualifications across age groups so that our learners can benefit as well as manage their work-life commitments. Since UAE is a diverse and culturally rich country, we have taken every effort to curate the curriculum for the broader needs of the youth. We are looking forward to welcoming both local and international students to our new Dubai Campus."